Iraq: Iran Versus Saudi Arabia, Minus the United States? Iranian President Mahmoud Ahmadinejad on Aug. 28 warned that a power vacuum is imminent in Iraq and said Iran is ready to help fill the gap. This statement represents the shift Stratfor was expecting in Iranian behavior toward Iraq, wherein Tehran is no longer interested in negotiating with the United States because it expects Washington to withdraw from the country. This does not mean the road to Baghdad is clear for the Iranians, which explains why they have said they would work with regional Arab states, particularly Saudi Arabia. Iranian President Mahmoud Ahmadinejad said Aug. 28 that his country is ready to fill the power vacuum in Iraq. Addressing a press conference in Tehran, Ahmadinejad said, "The political power of the occupiers is collapsing rapidly. Soon, we will see a huge power vacuum in the region. Of course, we are prepared to fill the gap, with the help of neighbors and regional friends like Saudi Arabia, and with the help of the Iraqi nation." The Iranians are reacting to the emerging situation in Washington, which is leading the United States to effect a military drawdown of sorts in Iraq. As we have said, this leaves the Iranians with no incentive to negotiate with Washington over the future of Iraq. Instead, Iran is moving to take advantage of the expected security vacuum in Iraq and consolidate itself as the major power broker there. But the Iranians are well aware that such a move will not be easy to pull off and will require Saudi cooperation. The Iranians intend to secure the Arab states' acknowledgement of Tehran's dominant role in Iraq -- a goal that will not come easily, to say the very least. Moreover, the United States is not about to allow Iran the space it needs to secure its interests in Iraq, as evidenced in the Bush administration's evolving Iraq policy, which we see shifting to a military strategy that will leave a residual force focused primarily on countering Iranian expansion in Iraq. 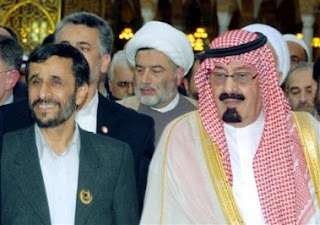 Ahmadinejad's message to the Saudis is essentially stating that the inevitable U.S. withdrawal from Iraq will leave the Iranians in a prime position to dominate the country, and that their historical Arab/Sunni rivals in Riyadh will have no choice but to sue for peace -- on Tehran's terms. Essentially, we are looking at the beginning of a full-scale and direct geopolitical struggle between Tehran and Riyadh over Baghdad as the United States redefines its mission in Iraq.